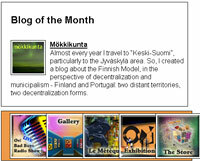 mokkikunta: Bloggers Unite : Refugees United - "World is Witness"
Bloggers Unite : Refugees United - "World is Witness"
Here is my contribution: a "pipe" from the feed of the “geoblog” World is Witness. World is Witness, a new “geoblog” from the U.S. Holocaust Memorial Museum's Genocide Prevention Mapping Initiatives, in partnership with Google Earth, documents and maps genocide and related crimes against humanity. The initial entries are from a Museum visit to Rwanda and the Democratic Republic of the Congo to learn about the legacies of Rwanda’s 1994 genocide, and the most recent entries are from a Museum visit to South Sudan and a return visit to the Congo. A great contribution for a good course!